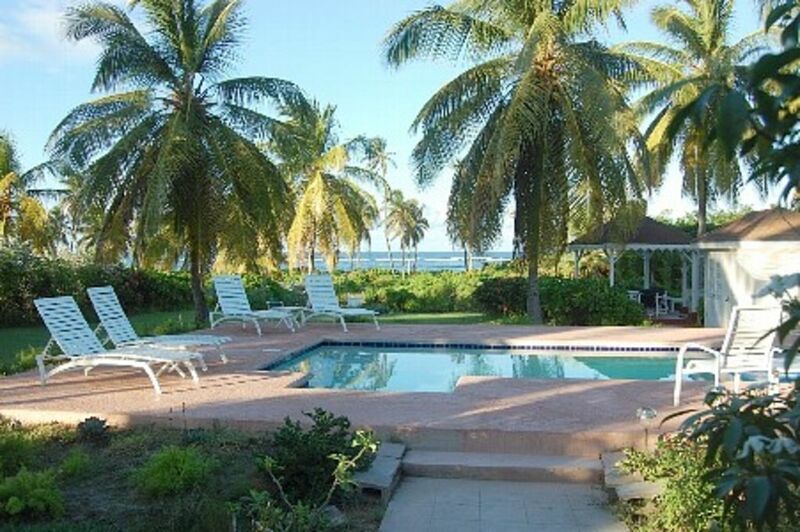 The Lazy Turtle Villa is one of the few beach side villas with private pool on Nevis. Set between the mountain and the beach, the views are stunning from every room. A private path leads you to the white sands of our Nisbet beach. A short walk leads you to Nisbet Plantation, a top rated plantation style inn where you can enjoy excellent dining or simply a cold drink at the casual beach bar. You can set up a tab there for your convenience. The villa includes a very large porch with 2 hammocks, a fully equipped kitchen with dishwasher, a living room with WIFI, TV and just outside is a gazebo where you can sit an enjoy watching the ocean. Our bedroom features Nevisian style mahogany beds. The master bedroom is air conditioned although most people prefer to fall asleep to the magical tradewinds. We will pick you up at Nevis airport or on St. Kitts free of charge and bring you home where a rental car will await you. We pride ourselves on our service and convenience. Tennis: Four Seasons tennis is second to none, with ten courts and ample facilities, services and amenities including night play and professional instruction. Managed by world-renowned Peter Burwash International, the site comprises four red clay courts (two lit for night play) and six hard courts (three lit for night play). Tennis equipment, apparel and accessories are available from the pro shop, located in the sports pavilion. The Four Seasons hotel is a short drive away and welcomes our guests for Tennis and Golf (see below). Spa treatments can also be reserved at their world class spa. Water Sports: Lazy turtle is a short drive from Oualie beach resort. There you will find scuba diving, mountain biking, snorkeling, sunfish sailing, sport fishing boats, a windsurfing school, hobie cats, kayaks and day sailing adventures on yachts and catamarans. You can rent boats, windsurfers and kayaks. The villa is adjacent to the world reknown kite boarding Herbert's beach. Guided sailing trips can be arranged at this location. Four Seasons beach club is a 20 minute drive and offers waterskiing, banana boating and tubing. Adventure sports and other activities: The mountainous terrain and beautiful beaches provide the perfect backdrop for horseback riding, mountain biking and hiking. We will direct you to some terrific guides who can help share the island with you and create a perfect workout as well! One of our favorite activities is hiking to plantation ruins. Our kids like to figure out the function of each building they discover. Climb to the top of Mount Nevis! This is not for the faint of heart and a guide is recommended. This is a stunning hike and the view from the top is well worth the effort! We love Nevis! We were lucky enough to find this paradise 18 years ago, when our parents bought property nearby. We bought the house next door to them. They live there in the winter and love to help our guests find out of the way to the island's treasures. Lazy Turtle is one of the only beachfront properties on island. We love the feeling of privacy we get from this house. In addition, we really feel connected to nature there. Nevis is a unique island. Nevisians are known for their friendly smiles and welcome to visitors. Nevis is special with only about 12,000 people, no high rise buildings (nothing taller than a palm tree allowed), no large cruise ships, no gambling. Lazy Turtle is the perfect combination of privacy and natural beauty. In addition, we strive to make your vacation unique and stress free. Come fall in love! Linens include sheets, bath and beach towels. Please bring shampoo and toothpaste. Maid service twice a week. A private path leads to the beach. The beach is unspoiled, uncrowded, and serene. Ocean views from all rooms. Linens include sheets, bath and beach towels. Fully equipped kitchen! We have a full list of grocery stores as well as local markets. Bikes can be rented at multiple local locations. Our veranda is spacious, with a dining table and living room set as well as 2 hammocks. Tennis available at the Four Seasons nearby. Award winning Robert Trent Jones golf course at Four Seasons as well as a locally owned inexpensive fun course are within a short drive of the villa. We pride ourselves on keeping everything 'stocked up' including beach chairs and cooler etc, so you don't have to worry. Our driver will pick you up at either the St. Kitt's or Nevis airports and will have a rental car waiting for you at home, should you desire. Our caretaker who has lived on island for many years will share the 'inside scoop' on restaurants and tourist attractions. Our housekeeper will keep keep things clean, so you don't have to. We have been enjoying Nevis for over fifteen years and will provide you with a comprehensive list of things to do, so that you can savor everything Nevis has to offer. Alternatively, the privacy and location of Lazy Turtle is the perfect place to get away from it all and simply reconnect with loved ones. Come and see why so many of our guests have come back! We've traveled quite a bit over the years and from start to end our experience with the Lazy Turtle Villa exceeded our expectations. The owner’s parents were an absolute pleasure to deal with during the entire process - extremely kind and helpful with all arrangements and island information. To us, the property was a quiet private paradise. It was perfectly maintained inside and out. All the comforts of home were provided. The minute we walked in the door we were delighted. The home was spacious and beautifully decorated with a very welcoming and comfortable Caribbean airy layout that led our eyes to the most magnificent back yard view. The sweeping back lawn leading to the beach was surrounded by spectacularly beautiful flower gardens. It really is such a peaceful setting. Great night sky star viewing at night. Jane assisted with getting us set up with a rental car during our stay. This too was top notch service. Our thanks to Jane and Marlon for Nevis island tour orientation. We highly recommend Marlon's taxis/rental/island tour services. Our thanks to Bonnie for taking care of return logistics. You can't go wrong with choosing to stay at the Lazy Turtle Villa. Without hesitation we would, and hopefully will, stay here again. We’ve been to Nevis many times and has become our favorite island. Lazy Turtle is one of our go to villas. Jane and Ron are like family and take great care of their properties and guests. We look forward to many more visits to this magical place. The only thing that could have made the trip better was to stay longer! Our week got off to a late start as a nor'easter trapped us on the interstate in Pennsylvania and our flight was delayed, however Jane monitored the updates and rearranged our pick up at SKB, the water taxi from St. Kitts to Nevis, and our taxi from Oualie to the villa to coincide with the delay. She even had a pizza waiting for us at the villa, and all complementary! There wasn't anything to think about after picking up our luggage at SKB. The villa is in a perfect location, quiet, right next to the beach, and Nisbet is right next door if you want to go out for a meal. We spent most of every evening on the large screened porch with a nice breeze and ocean sounds. Breakfast or lunch on the gazebo was as scenic as you can get with the ocean, beach and landscaped grounds. We didn't want to leave. The villa books quickly, we were fortunate that the week was available when we searched for a villa. We considered booking again for the same week next year before we left, but it is already booked. It is available yet in two weeks, if we could take the time from work again, we would be back! We can't find anything negative to say other than the nor'easter stirred up some waves for a couple days, but even then we just walked down the beach a little further to find some calm water. It really was an ideal place to relax for a week, and Jane made it hassle free. My wife and I spent a wonderful week at Lazy Turtle and agree with all the positives mentioned in earlier reviews - location, amenities, the efficiency of Jane and her team, comfort, and just the overall beauty of Nevis. We felt that this was one of the best houses we have rented, and we have rented a lot of cottages and villas over the years. Nisbet Beach was our favorite beach on the island because of its beauty, lack of many people and treasures to be found - shells, driftwood and sea glass. We tried a few of the restaurants on Nevis and all were good, although somewhat pricey. Our favorite was the Gin Trap with a fantastic bar area, fantastic views, and delicious food. I understand the house is on the market. If I was thinking about moving to Nevis, I would buy it in a heartbeat. We have stayed in many villas throughout the Caribbean and Lazy Turtle was, by far, the BEST Villa we have ever rented! Jane and her Team went above and beyond - starting with the stress free transfer from St. Kitts to the Villa. Everything was already lined up, Daisy, Marlon & Wincent were friendly and on time....a seamless process! The Villa is amazing and so clean you could eat off the floor. Bonnie was there to get us situated and show us around. Carmen visited twice to tidy up and she keeps the Villa in tip top shape! I can't recall ever staying in a villa this clean and well appointed. The gardens, the pool and the view are breathtaking. We spent most of our time at the pool or on the spacious screened in porch relaxing and taking it all in. If I could give Lazy Turtle 10 stars, I would! Nevis and Lazy Turtle are a little slice of heaven and we are already trying to figure out when we can return....and next time we'll stay more than a week! Thank you to Jane and her wonderful Team for making this a truly memorable vacation! Enjoy the privacy of a beachside villa with the convenience of resort living. We will greet you at the airport _ either in Nevis or St. Kitt's _ and a rental car will await you at the villa, should you desire one. Start a tab at the neighboring Nisbet Plantation beach club for award winning meals and beach side drinks. Meals can also be prepared in your fully equipped kitchen. This is one of few beachfront properties with a pool. It is located on the most desirable part of the island, convenient to the many places Nevis has to explore; hiking, horseback riding, kayaking, biking, golf and tennis and some of the best food in the Caribbean. We have been exploring Nevis for over 15 years and would be delighted to share our experiences with you. Golf: The Robert Trent Jones II course at the Four Seasons Resort is world famous and a short drive away. The course provides a dramatic view of the Resort, the Caribbean and the neighboring island of St. Kitt's.